This shows the potential of Blockchain as investors are ready to pump millions of dollars just on the name of the blockchain. #1. Finance: Most obvious application of blockchain is in the finance sector. With the inception of cryptocurrencies, all giants in the finance sector have started to adapt blockchains due to its fairness and transparency. Banking and finance sectors lack these both qualities for decades, which caused nearly all the financial pitfall but with the use of blockchain total cash flow can be viewed by the public as well as governments which exponentially decreases fraud and manipulation. #2. Publishing: Publishing industry is controlled by a handful of publisher’s when new and talented writers are rejected, they are forced to push there work on digital platforms. But digital comes with its cons, with plagiarism and less recognition, in the end, the writers suffer. Blockchain proves a perfect platform for publishing, with features like decentralization and total transparency. Writers will have full control of their content without any interference from the third party. #3. Music: Music industry faces similar problems as the publishing industry, with artists getting only a fraction of total earning from the work and sweat they put in. Production & distribution houses eat big chunks of total earning by only acting as a medium. By killing the middle man and creating the ideal platform, blockchain comes as a messiah for an artist. We can easily download songs for free from the internet, and that’s why artists end up getting no royalties. #4. Contracts and Documents: More than 50 lakh cases pending due to improper or lost documents in India. Contracts and documents on paper can be easily tampered or destroyed, but with the use of blockchain based smart contracts, physical documents can be made tamper-proof and transparent. With the blockchain enabled document storage we can make a system that has no single of point failure or at least less fraud in it. #5. Medical: Blockchain can play a life-saving role in the medical sector. Imagine, a patient met an accident in a foreign land, and doctors need to operate the patient but are completely unaware of the medical history. Here the blockchain can plug things up, with all medical records on the distributed blockchain one can ensure complete privacy and availability of the medical data at any point. #6. Supply Chain: Supply Chain is the industry which will see the complete transformation with the implementation of the blockchain tech. Blockchain provides a unique blend of privacy and transparency which is much-needed to counter fake products in circulation as well as it will help in logistics, tracking, and provenance. #7. Government: We have always seen politicians passing billion of dollars for various schemes, but never know where the cash flows. In this regard, the blockchain can turn game. With complete transparency achieved by implementing blockchain, corruption-free governance can be maintained, and real cash flow can be monitored. #8. Distributed Computing: Computing power is quickly becoming a fundamental necessity, like electricity and the internet. Many of the tasks that we do today, and certainly those in the scientific and entertainment industries require substantial computation. The trouble is that it needs resources that are currently not accessible to ordinary people. With the blockchain’s distributed nature we can trade our idle computational power with anyone, anywhere in the world. #9. Charity: Charitable organization receives loads of money for the welfare of poor but cases of corruption are also increasing worldwide. These can be controlled by the blockchain’s ability to transparently showcase transactions on its public ledger which can be ideal for use in charities. # 10. Digital Identity Management: Recently Adhaar data was hacked by a bunch of hackers. Adhaar data represents more than 100 million people in India. Blockchain’s encrypted ledger is the perfect solution to this shortcoming. blockchain-based identity network allows users, both individuals, and companies, to control and manage their identities. The platform will connect users to utility providers and other requestors of personal data, such as bank accounts, residency, citizenship by investment and passport services. # 11. Social Networking: Facebook, Instagram, Snapchat does not put a single piece of content yet earns billions. They are cashing in our content and time. Here the blockchain’s distributed nature can create a total content-based social network. Participants can earn as per the quality of content they have created. Just imagine earning on your post as per to the likes and views. Steem and Dtube are examples of an entirely new kind of distributed social systems. # 12. Energy: With the exhaustion of fossil fuels, electricity will be a primary source of energy, and we have to buy electricity from intermediaries so people will eventually start creating micro-grid in their homes. But when excess energy is generated, people can trade power with no intermediary, but how? Here the blockchain can be a trustless and distributed medium for trading energy and people can easily trade energy in exchange for cryptocurrencies. Power-ledger and Wepower are live examples of power trading platforms built on the blockchain. # 13. Ride Sharing: Uber and Ola do not own a single car yet they control Cab market. They only act as a bridge between driver and customer. These companies have immense controls over the whole network. They can track our location, have access to our details, contacts ->Total privacy invasion. Imagine a Blockchain based system where each driver could establish their rate, offer additional services like deliveries and can receive payment in a variety of methods like cash, crypto, etc. Drivers will have full control over their rides and earnings, no need for paying the middle man like Uber and Ola. #14. Stock trading: Buying and selling stocks is a hassle. To buy or participate in an IPO, we need to contact the broker. Blockchain enabled trading solution will kill all the middleman and provide clean and clear trading with genuine information of the company you are investing in. 0x is an excellent example of decentralized exchange. #15. File system: Imagine data saved on centralized server vanishes or leaked because of a server malfunction or a hack. This is not something new as we have already seen a number of breaches. Here the blockchain comes for rescue, with features of immutability blockchain becomes an ideal medium for storing data. Due to its distributed and cryptographic nature, if deleted from one node, the rest of the nodes have the copy. So, there is no single point of failure. People treat blockchains as magic but it is not. It cannot fly your Aeroplane or become your Auditor unless it is magic. Blockchains can only do what they are designed for and nothing more than that. For example, Bitcoin’s blockchain was designed to facilitate censorship resistant transactions and it is doing that from last 10 years. Plus making a working blockchain is hard as you need to get the incentives right for the parties participating in the blockchain ecosystem. If the right incentives are missing according to the industry needs, your blockchain is sure to fail. 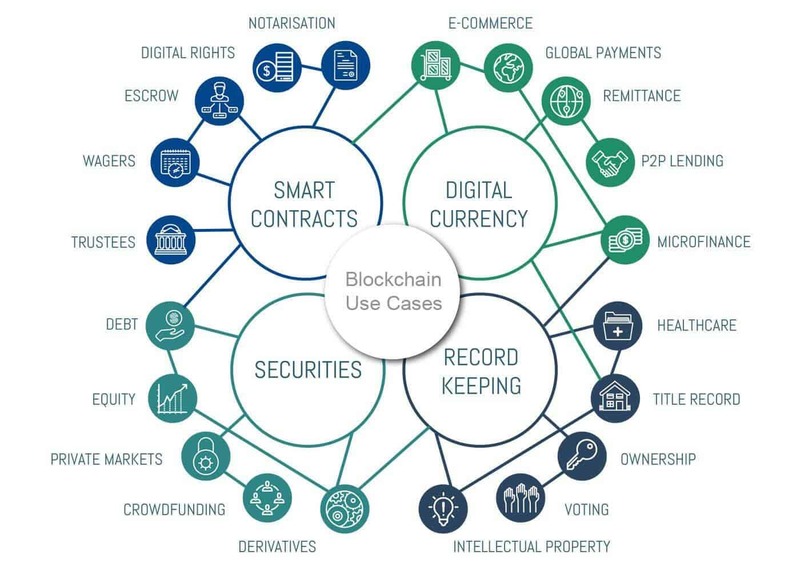 Anyways, go ahead and enjoy this 15 usecase of blockchain and do let me know if there are any more interesting applications of the blockchain.